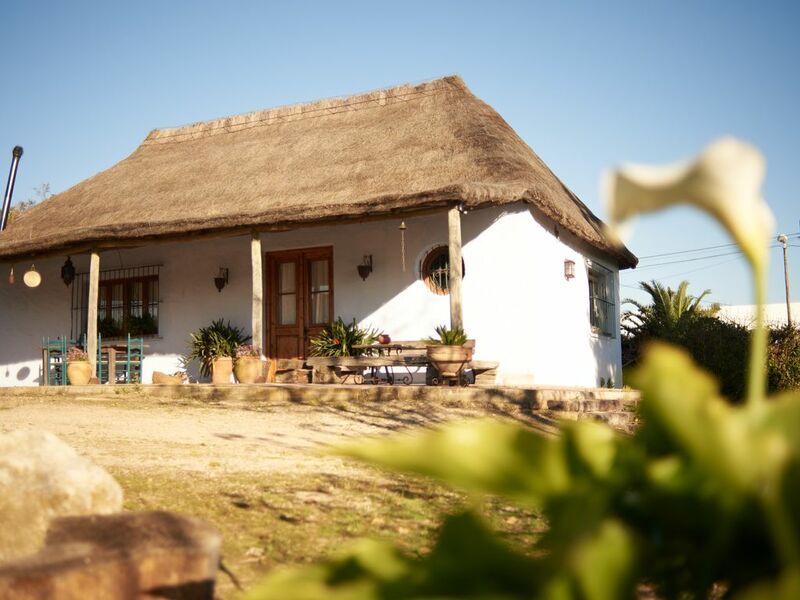 A cozy and charming traditional Andalusian cottage. Its beauty is enhanced by the trees and plants that surround it bringing a natural serenity to the house. This is the perfect place for anyone who enjoys tranquility and resting, and a must stay for any nature lover. Its location is ideal for anyone looking to visit this part of Andalusia.The cottage comes beautifully decorated with a full kitchen, full bathroom, large living room and a loft. There is a beautiful porch that offers views of the farm. Shared use of the swimming pool with our family. The timetable is from 12 pm to 9 pm. We are a young couple with two daughters, we love nature and our hometown, Jerez de la Frontera. I personally love spending time dancing and going to the beach. I like hosting foreign people and advicing for anyone travelling in the province. Our beautiful cabin is located on land my parents bought when I was a young girl. The idea was to create a space to enjoy nature and be in contact with the Earth without ever losing the comforts of city-life. We are happy to offer this piece of our world to anyone looking to explore this corner of Andalucía or simply want to take a few days to relax or rest in serene and comfortable lodging. This is the perfect place for anyone who enjoys tranquility and resting, and a must stay for any nature lover. Its location is ideal for anyone looking to visit this part of Andalusia. You can have a walk over the farm. Shared used swimming pool with our family. Enjoyed three wonderful days at the wonderful retreat in the farming area 10 minutes outsside of Jerez. Blanca has excellent taste, and added touches that made the stay very ‘homey’ and comfortable. At her suggestion we ordered a delicious meal from Chef Marmole which was delivered to the cottage. Very close to an excellent vineyard ‘Bodegas Luis Perez’ which is also a must visit. Sitting by the pool drinking wine was a great way to spend the afternoon. You will need a car and you are on a farm complete with dogs and roosters but the staying was the most relaxing and enjoyable portion of our two weeks in southern Spain. We will be back!! Das Haus ist wirklich zauberhaft: sehr geschmackvoll gestaltet, klug und bequem eingerichtet sowie bestens ausgestattet. Blanca, die sehr freundliche, aufmerksame und hilfsbereite Gastgeberin, sorgt für eine entspannte und angenehme Atmosphäre, ist immer erreichbar und kann mit guten Tipps für die Gestaltung der Ferien aufwarten. Aber auch „Faulenzertage“ lasse sich im Haus oder im weitläufigen Garten sehr genussvoll verbringen. Sehr schöne Finca in der Nähe Jerez, eingebettet in ein schönes, großes Grundstück. Nette und sehr hilfsbereite Vermieterin. An den nächtlichen Hundelärm sollte man sich gewöhnen können. Wir haben den Aufenthalt in La Volandera sehr genossen. Das Cottage ist urgemütlich eingerichtet, mit allem ausgestattet, was man braucht und jeden Morgen wurden wir mit frischen Brötchen versorgt. Besonders gut gefallen hat uns der Holzofen, der uns dafür entschädigt hat, dass wir abends wegen des Wetters nicht auf der Terrasse sitzen konnten. Blanca versorgte uns auch reichlich mit Info-Material über die Gegend. Das Gelände, auf dem das Häuschen steht, ist weitläufig und mit vielen lauschigen Plätzchen versehen. Es liegt außerhalb von Jerez, aber man ist schnell der Stadt und hat auch eine gute Anbindung an die Städte der Region. I would love to hosting you again.